I have been accused of being very fond of wine. Guilty as charged – though only consumed at appropriate times and in reasonable volumes. I am often asked what kind of wine I prefer, and my response is most kinds, particularly if they are delicious and reasonably priced (granted, my wife and I have different definitions of “reasonable”). Red, white, rosé, or sparkling; I love to try new wines and am fascinated by the copious amounts of great wine flowing from all over the world. New wineries are popping up each month. In Woodinville, Washington alone, you will find over 130 wineries and tasting rooms. Moreover, each of these wineries is creating fabulous wines from many of the different grape varieties – there are more than 80 grape varieties grown in the state. Oh, how to choose! People often comment that it can be a bit intimidating to choose a wine based on something other than which bottle has the cutest animal on the label. I find many of my new favorite wines through my local wine shop, whose proprietor hosts excellent weekly tastings and knows my preferences. He rarely steers me wrong. In addition, I enjoy following a couple of wine writers whose reviews are usually a good barometer for my palate. Their tastes tend to agree with mine, and their point systems make it easy to find something to try. It is easy to find excellent, highly rated wines at a high price point (many Napa wines), but I am most interested in finding good wines at an affordable price. 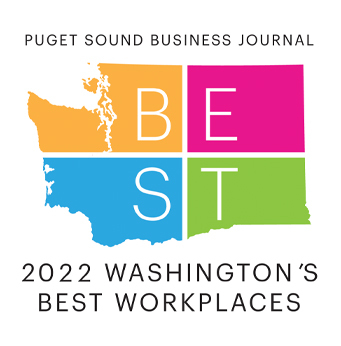 Fortunately, there are many that can be easily found – and many from Washington State. More on that later. I could talk about wine all day, but let’s switch gears. This past month, I went in for shoulder surgery to repair a muscle tear. I knew I wanted to find an excellent surgeon, but the process of finding the best person to literally cut into me was a whole lot harder (and intimidating) than finding an outstanding bottle of wine. 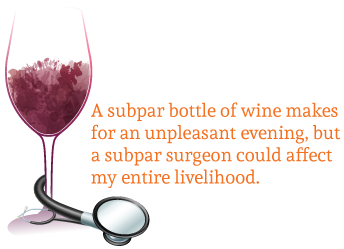 A subpar bottle of wine makes for an unpleasant evening, but a subpar surgeon could affect my entire livelihood. With the stakes so much higher, the question of how to find an affordable and high-quality doctor became even more pressing. Where could I find a 95-point rated surgeon at an affordable price? Where was my healthcare advocate who could offer guidance, or hospital critic writing reviews and assigning point systems? Like my wine, I want high-value healthcare, which requires access to cost and quality information in a format that I can act on and understand. That has not been so easy to find. According to the Robert Wood Johnson Foundation, “The historical opacity of healthcare prices is widely believed to be a major factor inhibiting the more efficient functioning of the delivery system.” No question, the system is opaque and it seems intentionally so. As a patient, this makes it easy to overpay for healthcare without knowing any better. But then again, do most people really care? If they are like me and have a high deductible plan, they may be more inclined to look into the cost of care. However, that isn’t all that easy to do, and not all healthcare is amenable to shopping. In my case of an elective surgery, I wanted to factor the cost into my decision. My health insurer was a good starting point, and in fact, the cost estimator on their website gave me decent information on the procedure’s cost and my share of that cost. It also made me curious if more people are using such resources and whether the information is helping to reduce costs. but the best value, and that requires quality information as well. That is where recent developments look promising. Although cost transparency data has not been around for a long time, more and more people now have access to it in some form, whether through their insurer or a third-party resource, and several reports have evaluated its effectiveness on impacting costs. The returns have not been too promising. Interestingly, the studies consistently reveal that some people will choose the more expensive provider, believing there to be a correlation between higher cost and higher quality. Research done by the Washington Health Alliance dispels that myth. Many examples demonstrate that the highest cost care can sometimes rank low on their quality measures (Pause for a plug: if you are unfamiliar with the Health Alliance, please check out their work at www.wahealthalliance.org. They would love to have the involvement of more employers). In addition, these transparency tools only reduce costs if people use them, and the studies show the utilization is mixed, at best. I believe there are multiple reasons for this. One, we are conditioned to go with our physician’s referral. I understand that; the system is complex, so a referral makes navigating it easier. For some people, their out-of-pocket cost isn’t affected enough by their choice, so why care? However, this was important to me in my own choice of providers, and cost data was only one part of the equation. Like my wine, I wasn’t looking for just the lowest cost, but the best value, and that requires quality information as well. That is where recent developments look promising. Just this summer, the state of Washington unveiled their new HealthCareCompare tool to provide consumers with both cost and quality data. It is intended to be an easily navigable tool and based upon the state’s all-payer database, which includes claims information from both private and government-sponsored insurance plans. The depth of the data and variety of sources is key and unprecedented. There are some decent resources available in the market, but that data is limited to that particular insurance carrier’s claims data only, or in some cases, Medicare-only data. The state’s new tool has great potential and presents an opportunity to get actionable information in the hands of consumers. Consumers can use it to find high-quality physician groups (using a star rating) and health centers. It will also provide cost estimates for a range of procedures, from basic examinations to joint replacements. At this point, it isn’t perfect (the cost information is based upon a range of low to high and averages, but doesn’t offer the cost for specific providers). The quality information is quite limited and there isn’t much detail on the method for determining the rating. We would also like to see the inclusion of patient experience results in future upgrades. We encourage you to check the new tool out at www.wahealthcarecompare.com. We will be watching to see how it is further developed. I previously mentioned the Washington Health Alliance. The Alliance’s mission is to offer trustworthy and credible reporting on all measures of healthcare value – cost, quality, and patient experience. Their community checkup website is a resource for this data and analysis of the quality of care in Washington State. It allows a user to compare results across hospitals, medical groups, clinics, and health plans. This information illustrates the significant variation in healthcare value and can help us make more informed choices, especially at critical times like when surgery is needed. So, maybe with these available resources, we can start teaching consumers that the quality of healthcare is measurable and highly variable, and it’s possible to become as savvy of healthcare shoppers as I am a wine shopper. I am encouraged by what I have been seeing. If you are interested in learning more about this subject, contact an experienced employee benefits broker. We are motivated to help your employees become better healthcare consumers. And if you want some tips on some fantastic value wines – let’s talk. I have all kinds of ideas on this subject as well.